Acne is not a problem faced only by teenagers. In fact, it is common among adults too, particularly women. 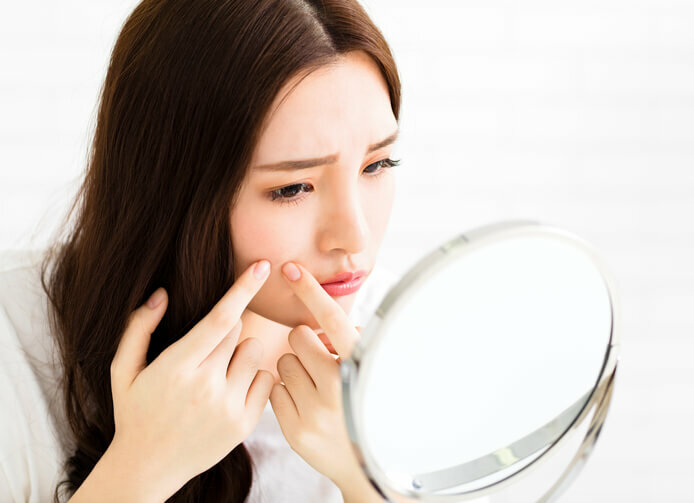 Acne is caused by a combination of oil gland activity, obstruction of follicular openings and inflammation caused by the Propionibacterium acnes bacteria. Stress and hormones also come into play – women usually have acne breakouts around their menstrual cycles. Often a chronic condition, acne can ease up, only to flare up again. Adult acne can be distressing, even if there are only a few spots on the face. If you’ve been using an over-the-counter product for your acne for a month but there’s no sign of improvement, seek medical advice. The most common is vitamin A-derived retinoid. Topical products also include antibiotics such as clindamycin or erythromycin, and benzoyl peroxide – these are sometimes combined into one formulation. Common antibiotics include doxycycline, erythromycin and minocycline, which are useful in reducing inflammatory lesions (the ones with pus, or those that are large and tender). These should be taken for two to three months. For women on contraception who have acne, many combined oral contraceptive pills are useful, such as formulations containing both ethinylestradiol and cyproterone acetate. These tend to reduce acne flares that occur around menstruation and, to some extent, facial oiliness. This is probably the most effective oral medication for severe acne. It controls oil production, reduces inflammation and prevents clogged skin pores. Isotretinoin should be used only under strict medical supervision. Women who take it should avoid getting pregnant, as the drug runs a high risk of causing birth defects. Superficial acne scars or pits can be treated with chemical peels and non-ablative laser therapy. The latter – done every four to six weeks for up to six sessions – remodels and plumps up the collagen below scars to reduce the appearance of the pits. For chemical peels, four to six sessions every other month are usually required. Deeper scars respond better to stronger laser treatments that penetrate deeper to remodel collagen and scar tissue. At least three to four sessions are recommended. Keloids are lumpy scars that tend to occur on the jawline, chest and shoulders of people predisposed to it. Injections are required in the lumpy areas to flatten and soften them. Post-inflammatory hyperpigmentation can develop, causing dark spots to appear. This can be treated with lightening creams, as well as chemical peels and some lasers.